It’s Melinda’s first day of ninth grade, and she’s alone. Her friends from previous school years have all abandoned her and disbursed into their own cliques. People whisper about her behind her back (and sometimes right in front of her) because she’s the one who called the cops on the night of the big party over the summer—the night when the thing happened that Melinda cannot speak about. Melinda spends the school year in silence, speaking so little that her throat becomes scratchy. The only person she’s able to make friends with is a new girl who hasn’t found a clique yet, and the only teacher who gives her any encouragement is her art teacher. Just about her only forms of self-expression are in the trees she attempts to draw and carve for art class and the unused janitor’s closet that she decorates with a poster of Maya Angelou and other items that make her feel safe when she retreats into the closet and away from the world. When I read young adult literature, I usually expect a good story with interesting characters. Artfully done prose is not, in my limited experience, a hallmark of these kinds of books. And that’s fine; a well-crafted storyline and compelling characters really are sufficient. But, after reading Hush by Jacqueline Woodson last week and Speak this week, I’m realizing that young adult fiction need not be just straightforward storytelling. Both Woodson and Anderson tell their stories using vivid language and prose styles that make their books something extra special. Melinda’s silence keeps her from getting the help she needs, but it also puts up a barrier between her and her parents, her teachers, her former friends. Most seem to write her off as a trouble-maker or a weirdo instead of trying to get to the bottom of her silence. I think this aspect of Speak makes it an important book not just for teens, but also for adults. I don’t work with teenagers myself anymore, but I do remember kids from my brief career as a high school teacher who might very well have been silent—or acting out—for reasons that weren’t just about making trouble or being lazy. Melinda, having just started high school, was surrounded by adults who didn’t remember the girl she was the previous year. They didn’t know there had been a change. Melinda’s parents were too caught up in their own jobs and marital issues to be able to really take the situation seriously. But Melinda herself was too young and inexperienced to know how to speak for herself. She needed more encouragement than she got. Although much of this book is upsetting, Anderson tempers the grimness with Melinda’s acerbic wit. And as the book draws to a close, Melinda finds ways to communicate. There’s one glorious moment in a bathroom stall when Melinda, with one small act of sharing, discovers that she has empowered dozens of other girls to speak. That moment made me feel like shouting for joy. For it is through speaking up about injustice, abuse, and violence that we find our power. 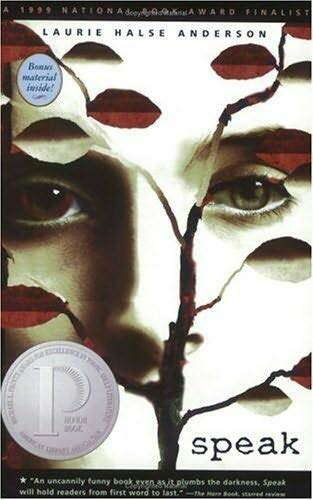 This was my first book by Laurie Halse Anderson, but it probably won’t be my last. I’m pleased to have found her. This entry was posted in Children's / YA Lit, Contemporary. Bookmark the permalink. I really liked this book. It’s made me want to read more Anderson too. Wonderful review. Thanks, Jeane. Have you read any more of her books yet? I’ve heard such great things about this book, and I have to say that your penultimate paragraph about teaching others to speak made me really curious to give it a try. You know that YA isn’t generally a genre I read deeply from, but I’m glad you found this book to be an example of what the genre can achieve! This sounds like a great book with a great message, and is definitely one of those pieces of fiction that can speak to readers of any age. Steph, I really do think a lot of YA novels can be every bit as good as a lot of fiction marketed to adults. The trick is just figuring out which ones. Great review. I read this book a few years back and had a similar reaction. It’s wonderful when a talented author can write about a tough subject in a way that makes it approachable and starts conversations. Melissa, She does make the tough subject approachable. I was impressed with that. I’ve had very mixed reactions to Laurie Halse Anderson, but when she’s on, she’s on. Chains was the other one of her books (besides Speak) that I truly loved, whereas Wintergirls depressed me hugely, and Catalyst I didn’t like at all. Jenny, I think Jenny’s review here of Catalyst wasn’t great either. I have Wintergirls out from the library but I doubt I’ll get to it before it’s due. I read this a few months ago and loved it. I have another book by the same author (can’t for the life of me remember what it is right now) and look forward to reading it! This book solidified my belief that YA novels have a much wider appeal than some people give them credit for! Kathleen, Yes, YA can definitely have adult appeal. Some of it is better than most adult fiction. Speak introduced me to Laurie Halse Anderson and I’ve been a huge fan every since. This novel was amazingly written and executed. Chrstina, do you have any other favorite books by Anderson? This sounds amazing. I really want to read it – thanks for the great review, Teresa. You’re welcome, litlove. I hope you do get a chance to read it. Because I work in a junior high school library, I do read a lot of Y.A. fiction–but I haven’t read SPEAK yet. I must add it to my tbr list. Speaking of Y.A. literature, I recently read Judy Blundell’s WHAT I SAW AND HOW I LIED, which is a terrific coming-of-age novel set in the late 1940s with lots of period detail and an interesting (and unresolved) mystery at its heart. If you haven’t read it, I recommend it highly. Deb, I do like the 1940s, so I’ll look into What I Saw and How I Lied. Sounds like a good one. No, it’s the only one so far. I always find a new author I want to read more of, and get sidetracked by other books first! Jeane: I hear you on that! It happens to me all the time. I’m trying to at least get to a second book within a year of a new discovery. I thought this book was thought-provoking and well-written. Great review! Swapna: I agree–this was such a nice mix of great writing and great content. I loved the voice in this one.